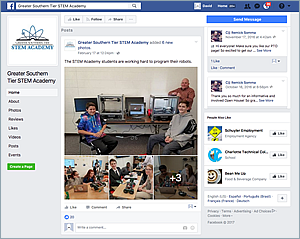 Our facebook page has lots of images and videos of what is happening at STEM Academy. 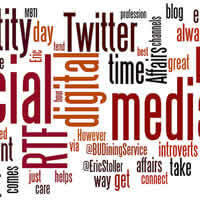 Visit our page, Like Us, and then keep coming back to see all of our activities. We post videos to our YouTube channel. You can visit the page and subscribe to the channel for video of our activities. 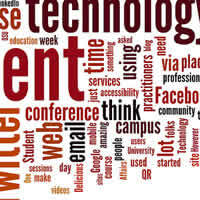 GSTSA is a Pathways in Technology Early College High School (P-TECH). P-TECH is a new model for secondary education that brings together the best elements of high school, college and the professional world. 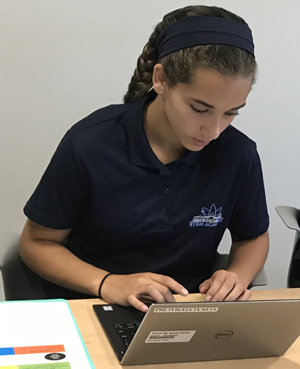 Students take the lead role in their learning, choosing pathways to their careers and taking college-level, credit-bearing courses from their first year. The Greater Southern Tier STEM Academy looks and functions similar to a hybrid between college and the workplace. The four- to six-year sequence emphasizes individualized pathways to completion, workplace experiences, mentorship, in-depth project-based learning and real world experiences. Greater Southern Tier STEM Academy students will complete high school, earn a college degree and be ready to begin a career by the time they graduate. The length of enrollment is tailored to the learning needs and educational goals of each student. 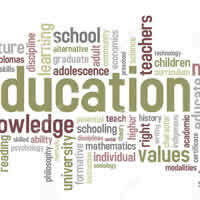 - Students take regular high school courses required to earn a high school diploma. - Students receive individual support and guidance as they plan their high school years and begin taking college classes. - Students receive mentoring and internship opportunities to prepare them for college and competitive careers. - Students have the opportunity to earn an associate degree from Corning Community College at no cost. 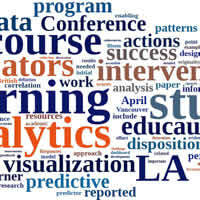 - Students take college courses with college faculty during normal school hours. - Students may continue their studies at a four-year college upon graduation. - Students participate in real work experiences in which they learn teamwork and develop the skills needed for professional and personal success. - Students explore various careers through internship, coaching and mentoring opportunities provided by regional business partners. Learn about students and the application process. Greater Southern Tier STEM Academy students are dynamic and diverse. There are no tests to get in - students of all abilities will be accepted. 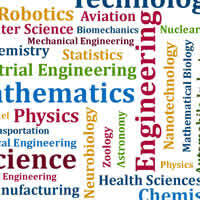 Have an interest in and capacity for real-world applications of math, science and technology. Have an interest in design, engineering; understanding of "how things work". Work well in a collaborative team environment and like learning with their peers. Are able to persist to solve a problem or complete a project. 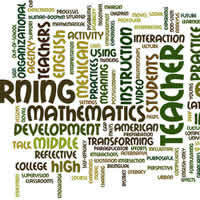 Are motivated to learn in new and exciting ways and thrive in a non-traditional classroom setting. Aren't afraid of change and want to create their own pathway to success. Desire to build strong skills in communications, critical thinking, problem solving and time management. Like to think outside the box. Have the desire to use their talents and skills to impact their local and global communities. Eighth-graders in participating districts can apply. Along with an application and a form that parents fill out, applicants must submit written recommendations from teachers and school counselors. Applicants also must participate in a personal interview. Each spring, a minimum of 40 students will be accepted for the following school year. School counselors in students' home districts can provide information on application deadlines. Completed applications received by the deadline are evaluated by the Application and Recruitment Team. Selected students are required to attend a "Summer Bridge" program for incoming ninth graders. Home school districts will transport students from their home school to the Greater Southern Tier STEM Academy. Students will be bussed back to their home schools in time to participate in sports and other after-school activities. 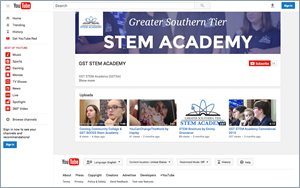 What is the Greater Southern Tier STEM Academy? 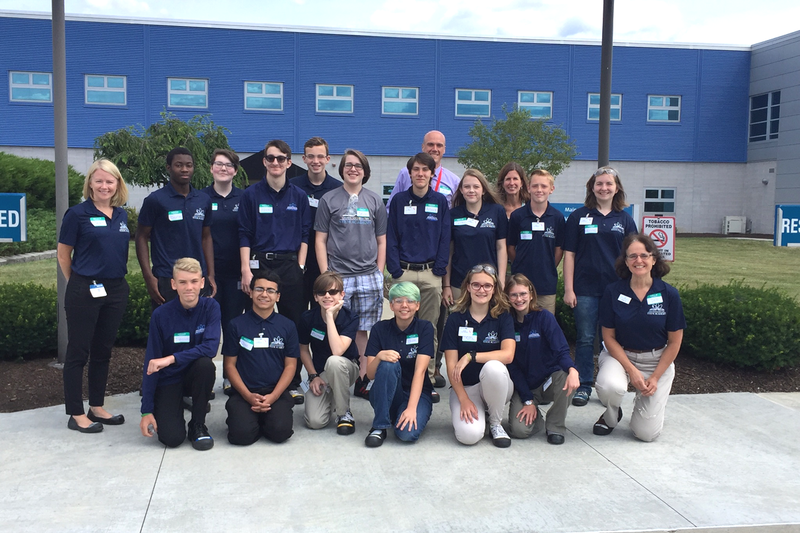 The Greater Southern Tier STEM Academy is a Pathways in Technology Early College High School (P-TECH) that opened in September 2016 and enrolls a minimum of 40 students each year. The collaborative partnership of school districts, higher education, and business employers prepares Students in the Greater Southern Tier for high-skills jobs of the future in advanced technical manufacturing, clean energy and health care. This 4-6 year model includes college-level, credit-bearing coursework and allows students to choose their own "pathways" to high-skill jobs. 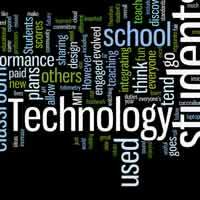 Which school districts are participating in the P-TECH program? The following districts participate in the STEM Academy: Elmira, Addison, Bath, Bradford, Campbell-Savona, Canisteo-Greenwood, Corning-Painted Post, Elmira Heights, Horseheads, Odessa-Montour, Spencer-Van Etten, Watkins Glen and Waverly. Where is the GST STEM Academy School? The STEM Academy is located at 2634 Goff Road in Corning, NY. 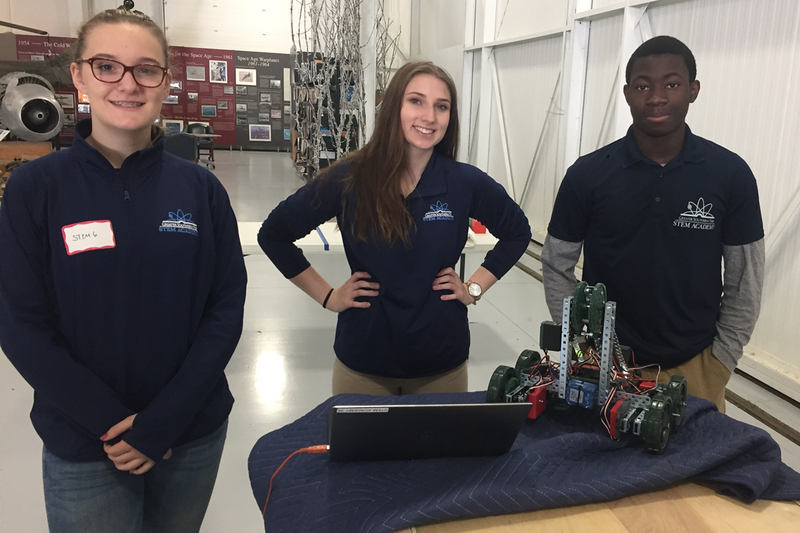 Students spend their ninth- and 10th-grade years at the STEM Academy and their 11th- and 12th-grade years are spent at GST BOCES and Corning Community College. Years 13-14 (if needed) take place at CCC. How is P-TECH paid for? A consortium of GST BOCES, its component school districts, Corning Community College and 16 regional businesses applied for and received a statewide grant for $3 million in 2015 to launch the Greater Southern Tier STEM Academy. The Elmira City School District is handling the financial administration duties. School districts pay a tuition fee for students they send to P-TECH, which they can be reimbursed through BOCES aid. The grant covers the rest of the costs associated with the school. Who is teaching at P-TECH? Rob Sherburne serves as the principal of the STEM Academy. The school employs an English Language Arts teacher, math teacher, science teacher, social studies teacher, DDP teacher, PE/health teacher, Special Education teacher (beginning in fall 2018) and teaching assistants who work closely together to integrate the subjects in lessons. They are assisted by a part-time STEM instructional coach. The school also has a full-time school counselor on staff and will add a college liaison in July 2018. What kind of students are good candidates for the GST STEM Academy? 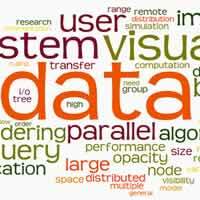 Have an interest in design, engineering and understanding of "how things work". Be able to persist to solve a problem or complete a project. Be motivated to learn in new and exciting ways and thrive in a non-traditional classroom setting. Isn't afraid of change and want to create their own pathway to success. Desire to build strong skills in communications, critical thinking, problem-solving, and time-management. When and how do students apply? Eighth-graders in participating districts can apply. Along with an application and a form that parents fill out, applicants must submit written recommendations from teachers and school counselors. All application materials must be submitted to the offices of the middle school counselor in the student's district of residence. Applicants also will participate in an interview session. Along with an application and a form that parents to fill out, applicants must submit written recommendations from teachers and guidance counselors. Applicants also must participate in a personal interview. Each spring, a minimum of 40 students will be accepted for the following school year. Each district's school counselors can provide information on application deadlines. Completed applications received by the deadline are evaluated by the Recruitment and Admissions Team. Selected students are required to attend a "Summer Bridge" program for incoming students. What if a student is not selected for the GST STEM Academy for 9th grade? Students who meet the requirements but who are not selected will be placed on a waiting list for their school. Should a slot become available before the start of the school year, it will be offered to a student from the waiting list for that school. If all the available slots for a particular school are not filled, a lottery will be held among students on the waiting lists for all the component school districts. 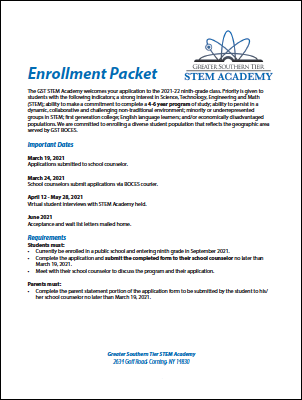 Is freshman year the only time students can enter the GST STEM Academy? Yes. 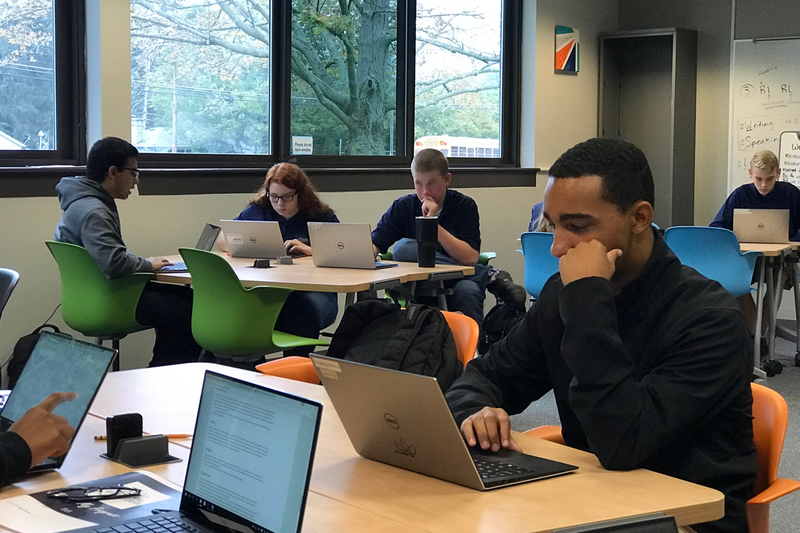 Because of the way the curriculum is structured to allow for acceleration into college courses, only current eighth-graders are eligible to apply to P-TECH, and students must enter the program their freshman year of high school. Is transportation provided to P-TECH students? Yes, home school districts will transport students from their home school to P-TECH in the morning, as well as from P-TECH back to their home school in the afternoon. What is P.E. like at the GST STEM Academy? Physical Education classes are provided through the GST STEM Academy. Can GST STEM Academy students participate in sports or other extra-curricular activities? Yes, students are bussed back to their home schools in time to participate in sports or other after-school activities. What if a student has taken accelerated classes in middle school? 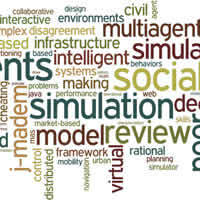 An education at the GST STEM Academy is highly individualized to each student. Students' curriculum will be adjusted to reflect the appropriate level of subject mastery. Do GST STEM Academy students take part in their home high school graduation? Yes, students will be able to walk with their peers during graduation, although they wonâ€™t actually receive their diploma until they complete their selected program pathway. What Associate Degrees or other industry-recognized two year certification can students earn through this program? What are the benefits associated with earning an associate degree or other industry-recognized two year certification? A two-year community college degree, at present full rates, costs about $6,262, according to the College Board. A bachelor's degree from a four-year, private residential university costs approximately $158,072. The Georgetown Center estimates that 29 million jobs paying middle class wages today require only an associate degree, not a bachelor's degree. What makes the P-TECH model so beneficial is that not only are graduates armed with skills to succeed, they pay nothing for the AS and AAS degrees. The AS and AAS degrees allow students to continue into a four-year bachelor's degree program if they desire. What college costs are covered for students enrolled in the GST STEM Academy? All tuition for credits, labs and books are covered, and students are granted the same privileges as other CCC students. However, room and board are not included. Who are the business partners, and what role do they play? The regional business partners are committed to serving as mentors for students throughout their program career, meeting with them in person and by virtual communication, as well as guiding internships and putting graduates in line for jobs within their companies. Participating companies are: Corning Incorporated, Hilliard Corporation, Cameron Manufacturing and Design, Hardinge Incorporated, Vulcraft Group, Dresser-Rand A Siemens Business, Southerntier Custom Fabricators, Guthrie Corning Hospital, Arnot Health, Chemung County Health Department and Hunt Engineers, Architects and Surveyors. Click the icons to visit their websites.